"Jo & I picked up the loom from the fantastic Town Farm Workshop up at Sixpenny Handley. 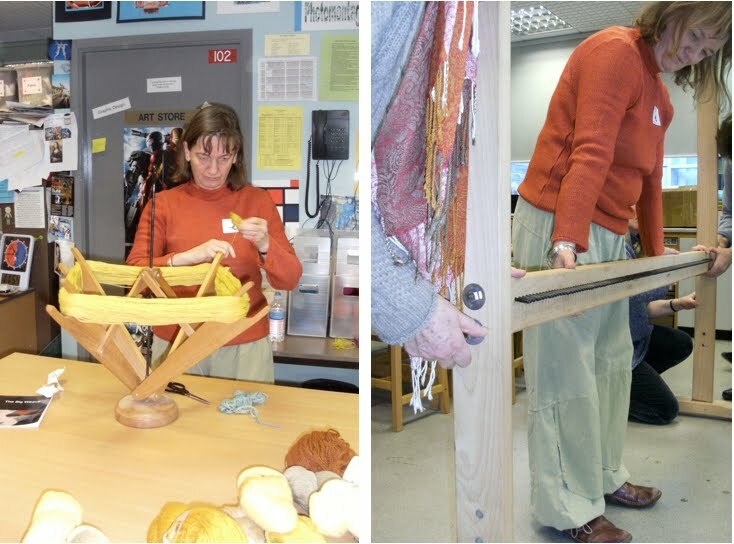 It had been their Open Day & it was awe-inspiring to see what they get up to there - so much colour & texture, so many different forms of weaving, so much talent! 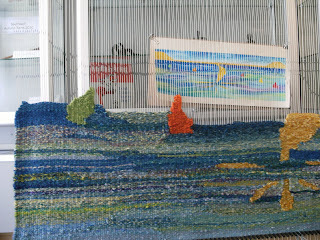 The Big Weave stayed safely wrapped up in our car overnight then set off early in the morning to Wimborne Market, where we set up the loom in Hall 2 amongst the stalls, at 8 am. We didn't have many "customers" for the first hour or so but a few stallholders came over & "had a go". Gradually the market filled up & people started to stop, ask us questions & join in. 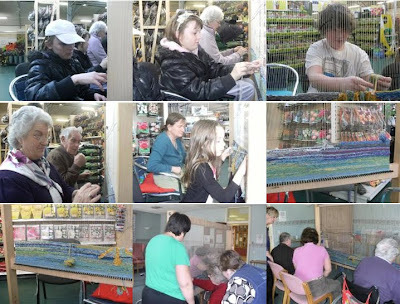 Several members of the Dorset & New Forest WSD Guilds & also the Countryside Spinners, who meet at The Courtyard Centre in Lytchett Minster on a Tuesday lunchtime, came along & helped. 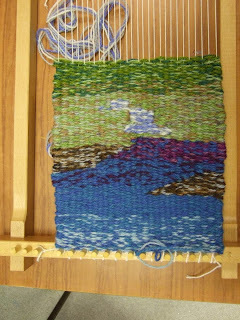 It never got really crowded but we didn't have time to draw breath until about 12.30, when it was nearly time to throw the blanket over the loom & leave it for the night. The market buildings are locked once the day's trading is done, so we knew it would be safe in there. 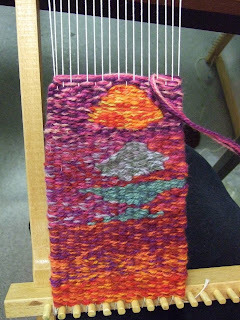 Sunday morning was a relaxed 8.30 am start, as we didn't have to set the loom up. Again, it was a reasonably steady-paced morning, never too crowded but lots of people admiring the Weave & stopping to talk, and a fair few joinging in. 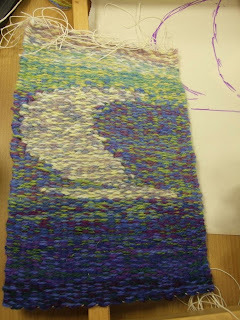 Carol Lewis from the Dorset WSD Guild came along & helped, and several members of Wimborne's Happy Patchers took part too. 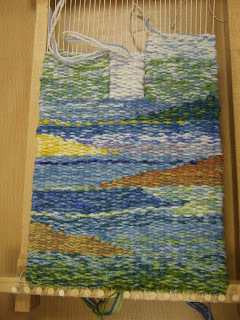 The weave is progressing well; we "finished" the sea and have moved up onto the coastline now. We didn't have any especially young or old weavers, just a pleasant mixture of the public at large, and not everyone could be persuaded to sign the book, but I think everyone who joined in enjoyed themselves"
The loom returns to Westfield Arts College giving pupils a chance to weave in their thread. 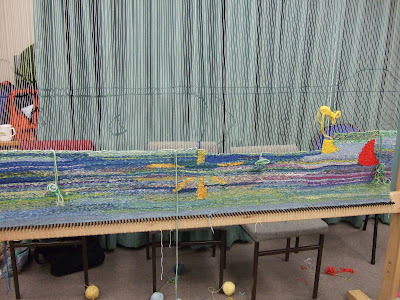 Westfield Arts College were excited to have The Big Weave back in school for 3 days, with everyone keen to see how the tapestry had grown. 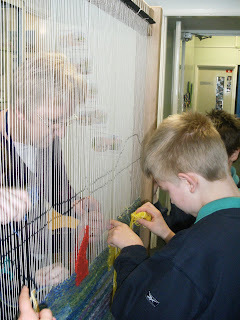 Everyone in school had the opportunity to weave a thread with our site manager being the first to weave. 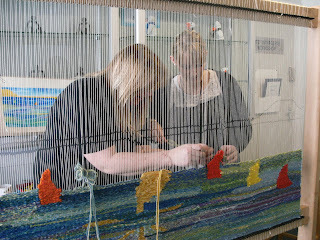 Some pupils had to wait patiently and enjoyed just watching others at work. 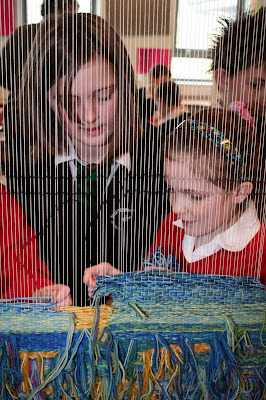 When the loom left there seemed to be a void in the corridor with pupils asking when it was coming back and what would we be weaving next! 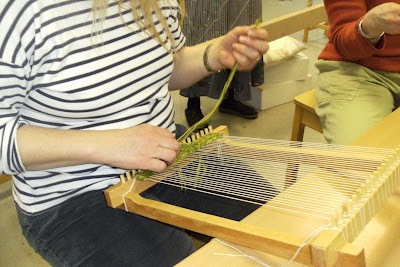 The loom left us and went off to Sixpenny Handley for 2 days. 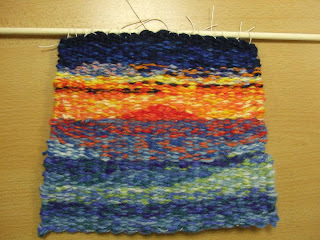 We all look forward to seeing the progress over the next week and will be a little disappointed when it's all finished! 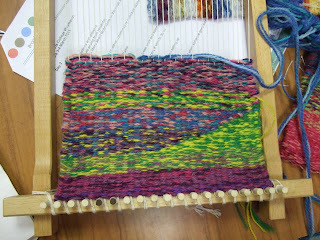 Thanks to all who joined in and to the volunteers who managed the weave for the three days. 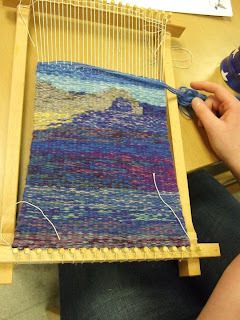 The Dorset Weave visited Shaftesbury School on its journey around local venues. Here is what they had to say after the visit: "We had children from local Primary feeder schools including Motcombe, Shaftesbury and Abbey School taking part in the project. 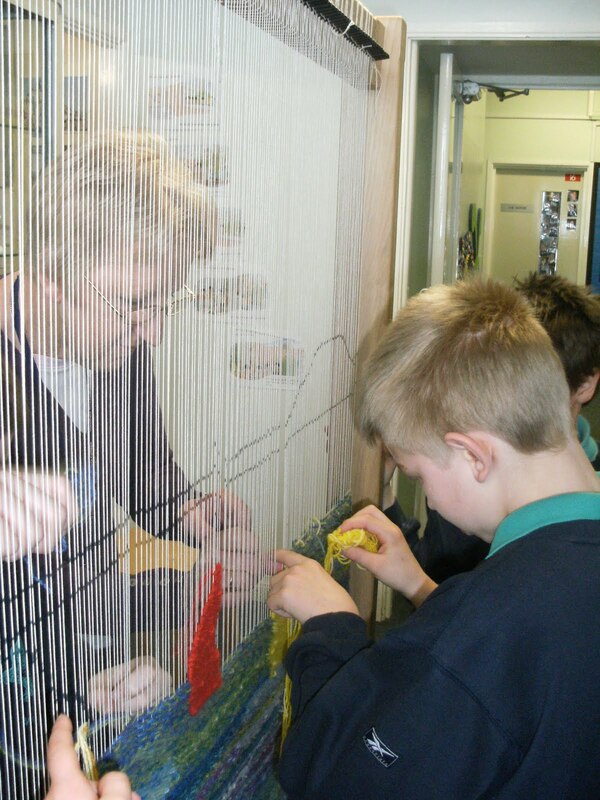 Shaftesbury School students helped the younger children and enjoyed having a go themselves. Over 50 people took part during the session. Comments from those involved included ‘It’s great to see so many hands working together’ and ‘I liked doing the sea, it was very relaxing.’"
Fourteen classes at St Andrews Primary School enjoyed weaving into the tapestry when it visited school last week. Several didn't want to stop! 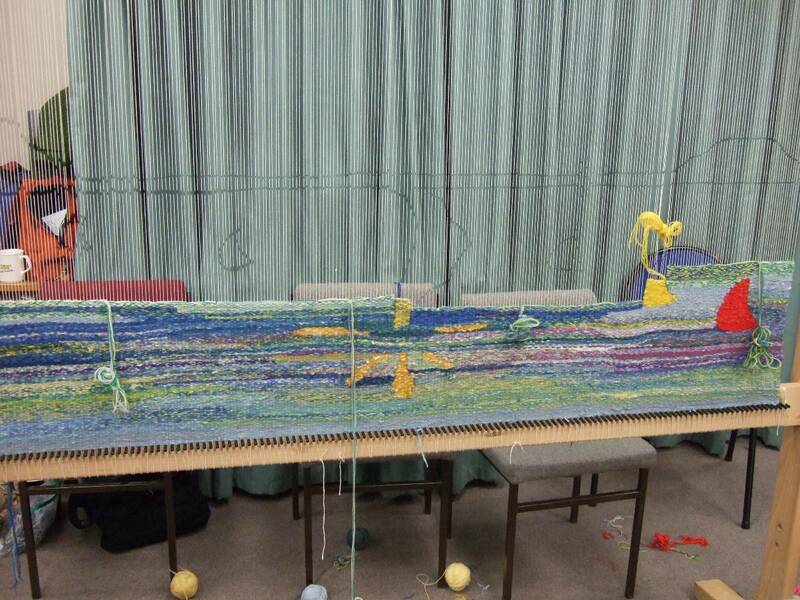 Creativity knows no bounds - here are first tapestries woven by attendees at Westfield training days - I hope you'll agree that the results are very impressive. 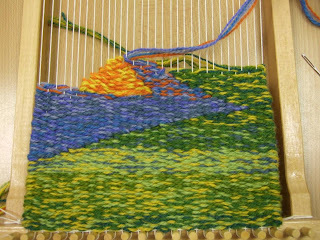 Have you woven your thread into the Dorset tapestry yet? The Dorset Weave will be visiting the following venues where volunteers will be on hand to show you how. After just two days of training in community weaving the Quangle Wangle Choir set off with some trepidation to share their new found skills with others in their community. 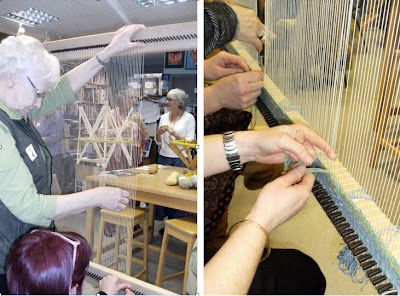 The loom went up smoothly and the choir was delighted to discover that people love to weave. 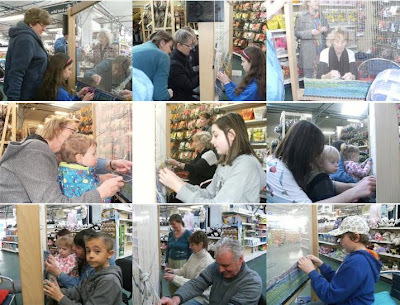 A great time was had at Dorset Women's Day on Saturday and in Goulds garden centre on Sunday. 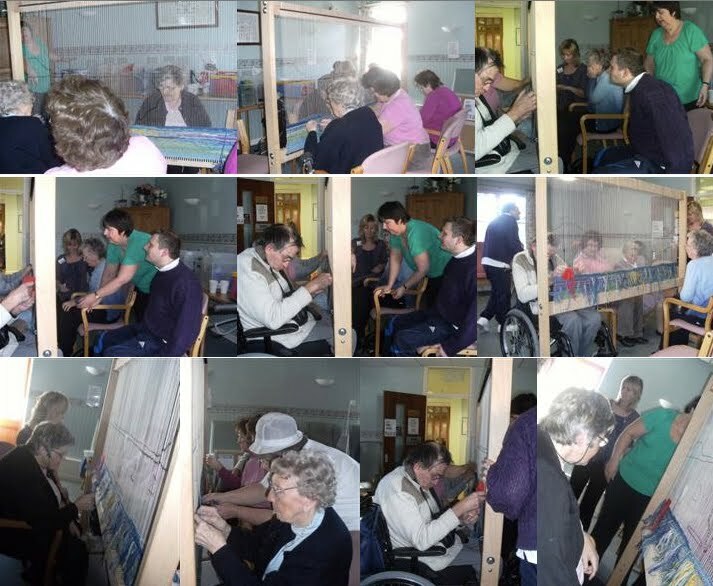 A great range of people joined in from toddlers to grandparents. 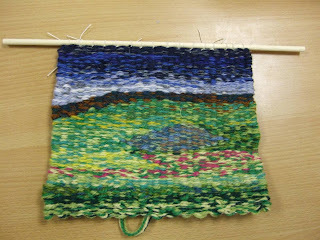 There was lots of chat, with people meeting old friends and making new ones and terrific enthusiasm for the project as a whole and the wonderful colours. 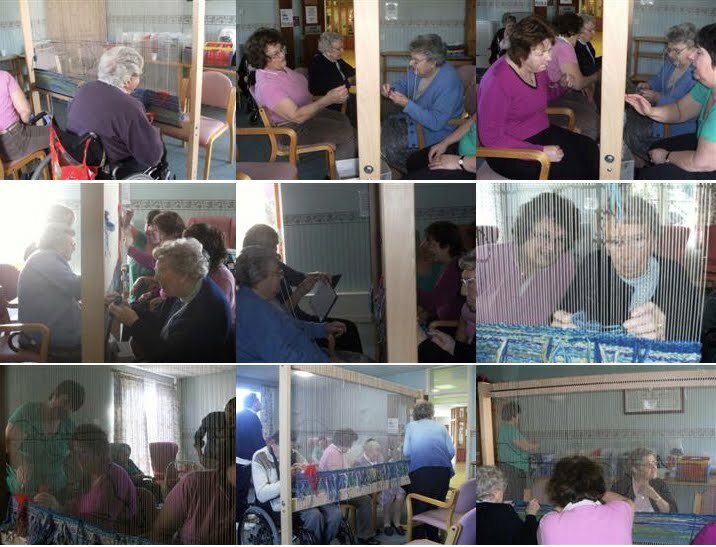 Monday saw the choir at Acorns, a day centre for both elderly and disabled people. Another really good day was had, hard work but very rewarding. The youngest person to get involved over the weekend was 20 months old, today the oldest was 87! Below are photos of the local community taking their turn to weave into the Dorset Tapestry. 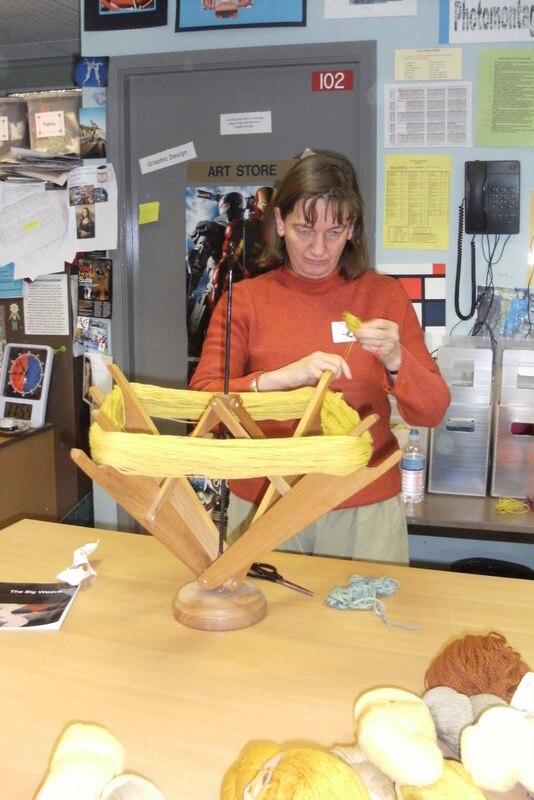 This week The Big Weave artists visited Westfield Arts College in Weymouth. 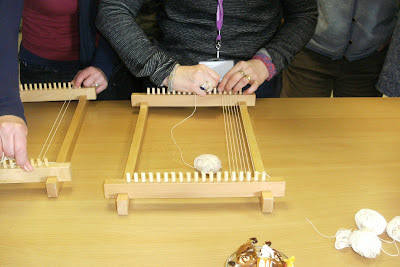 Members of local schools and community groups attended a two day training workshop to learn the skills of community weaving. 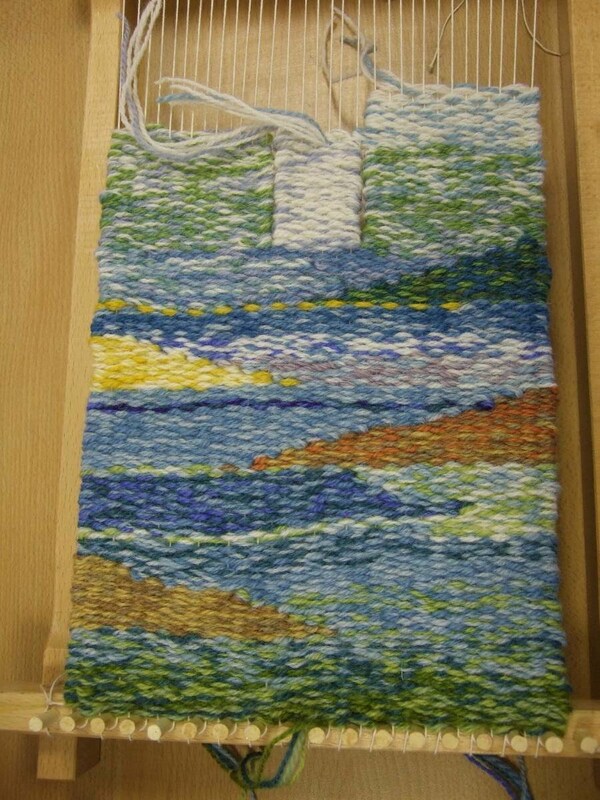 The various groups will now take the community loom, with The Dorset Weave tapestry, to public venues in and around Weymouth. They will share their new found skills and give local people the chance to be involved in creating a unique community tapestry; a potential local heirloom. 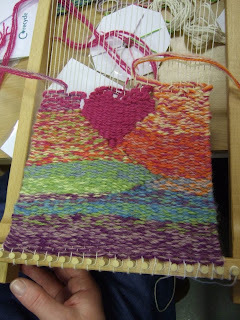 Sat 5 March Dorset Women's Day The Dorford Centre, Bridport Road, Dorchester 2-4pm. 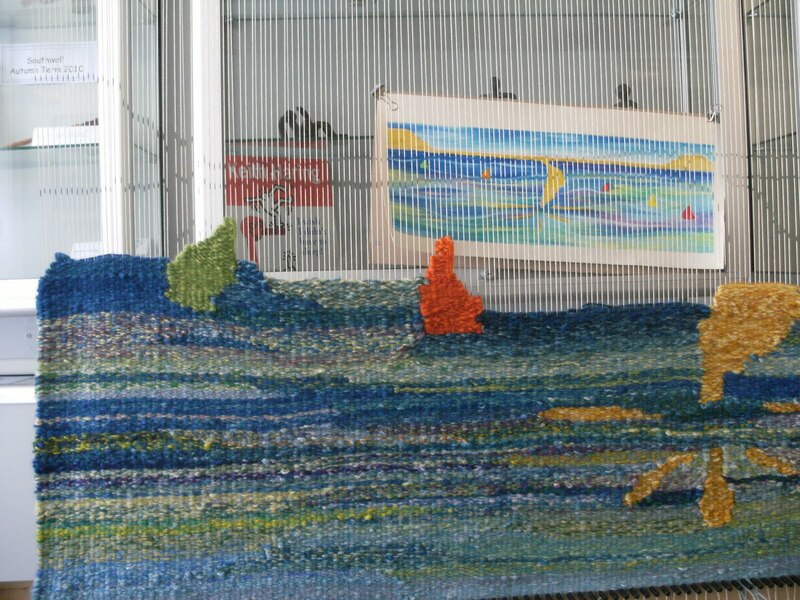 Sun 6 March Gould's Garden Centre, Littlemoor Road, Weymouth. 10.30 - 4.30pm.